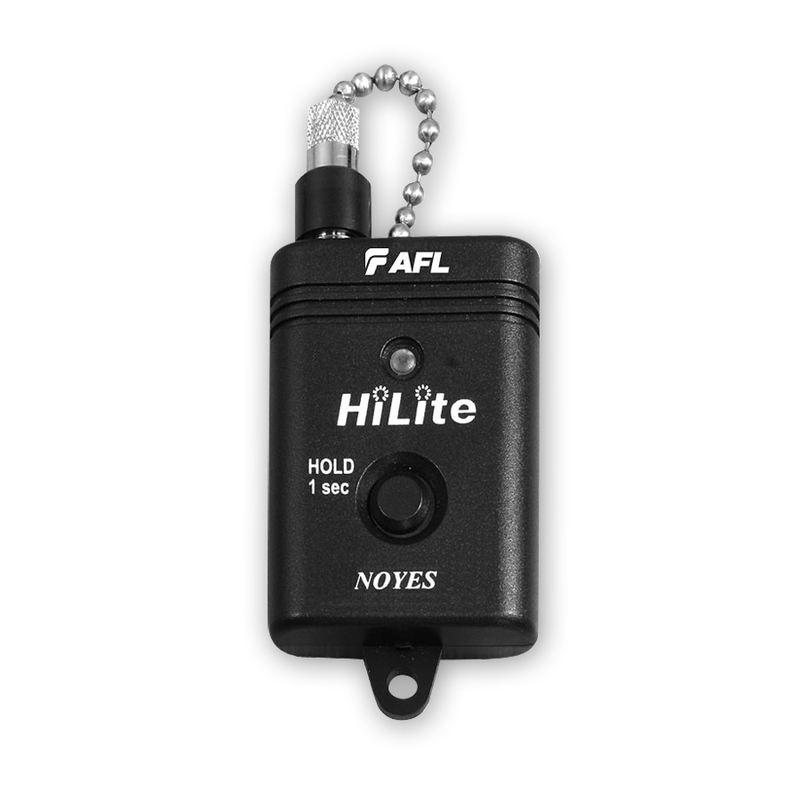 "The HiLite is a compact but powerful visible red laser source designed to troubleshoot faults on fiber optic cables. 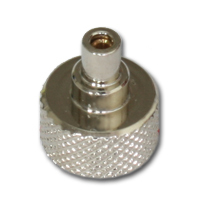 Light generated by the HiLite will escape from sharp bends and breaks in jacketed or bare fibers, as well as poorly mated connectors. Thus the HiLite can identify faults in fiber optic jumper cables, distribution frames, patch panels, and splice trays." 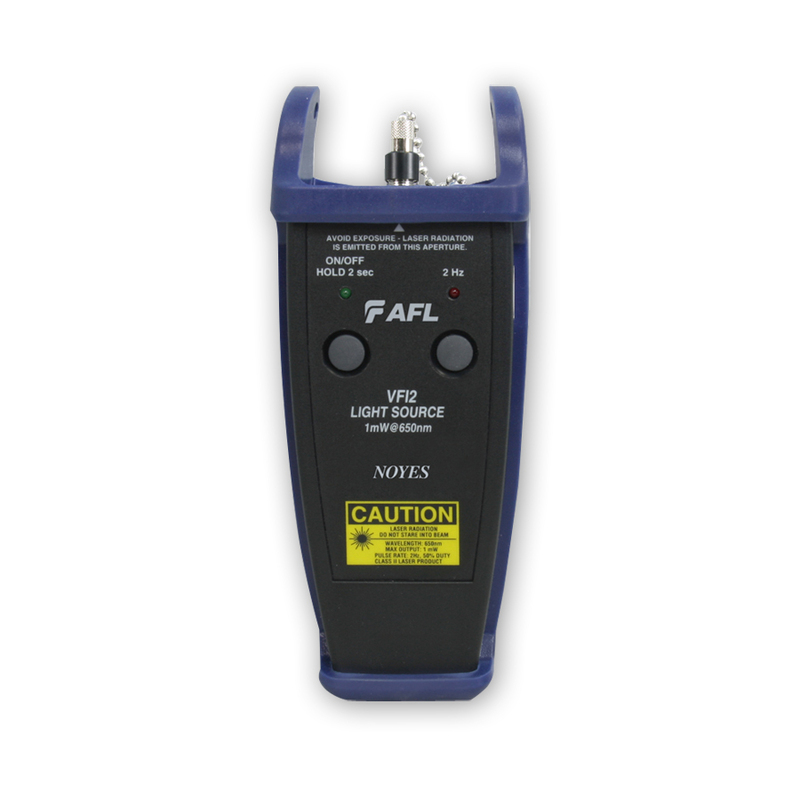 The VFF5 Visual Fault Finder is a light source used to locate breaks and misconnections in fiber optic cables. It's ideal to verify continuity, test and find breaks in LANs, fiber data links and loops, telephone, shipboard and other vessels, and intrinsically safe process applications where fiber is used instead of copper. Rugged VisiFault Visual Fault Locator for fiber verification and troubleshooting. 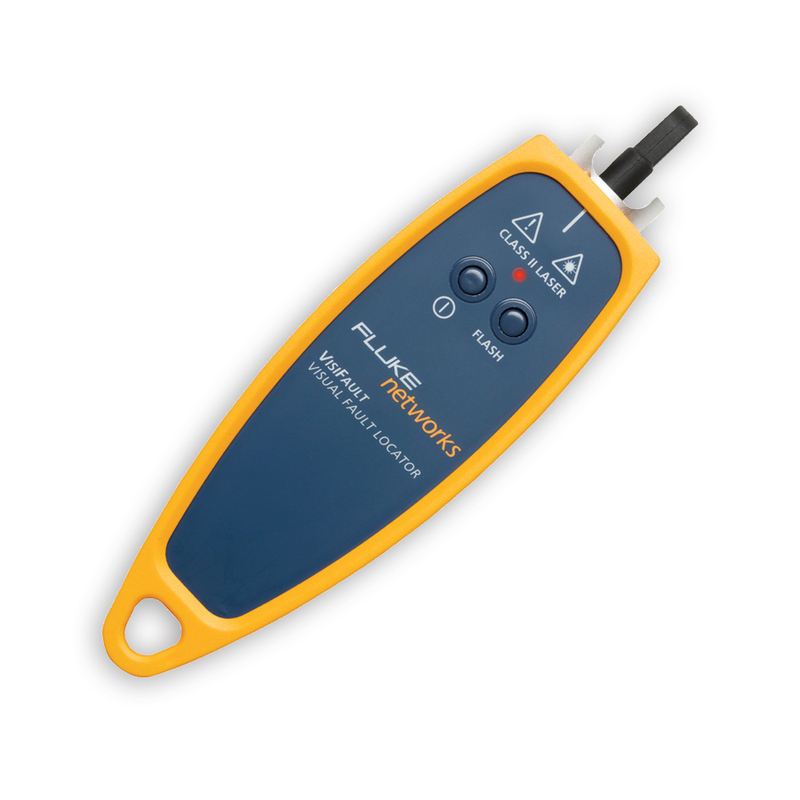 You can diagnose and repair simple fiber link problems with Fluke Networks' VisiFault™ Visual Fault Locator (VFL). 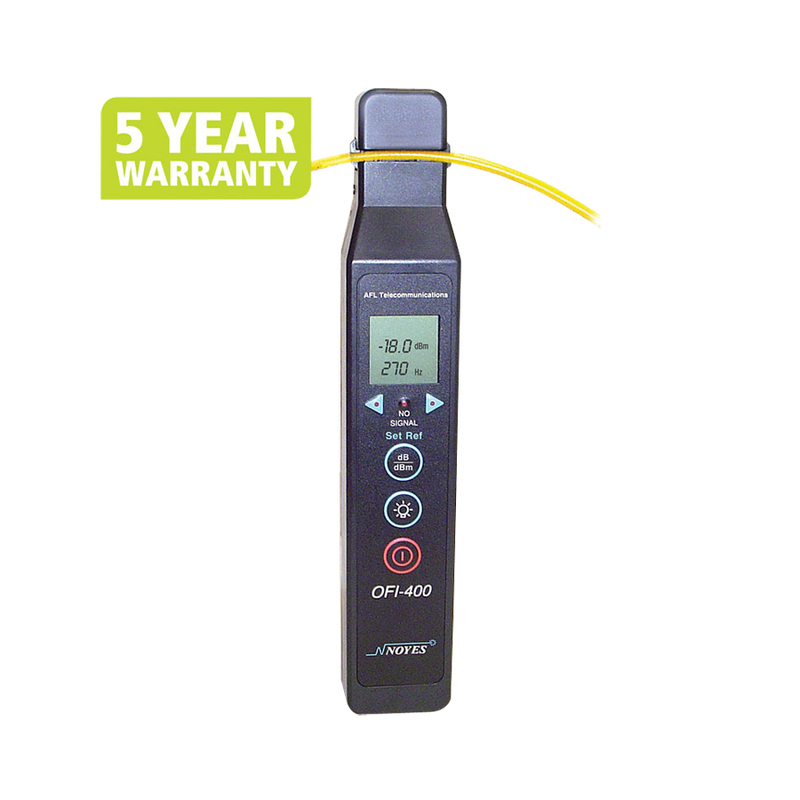 The laser-powered VisiFault locates fibers, verifies continuity and polarity, and helps find breaks in cables, connectors and splices. Continuous and flashing modes make for easier identification. 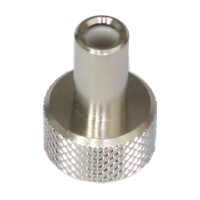 Compatible with 2.5mm and 1.25mm connectors for easy connection. Ruggedly constructed for demanding field-testing. Long battery life for hours of use. 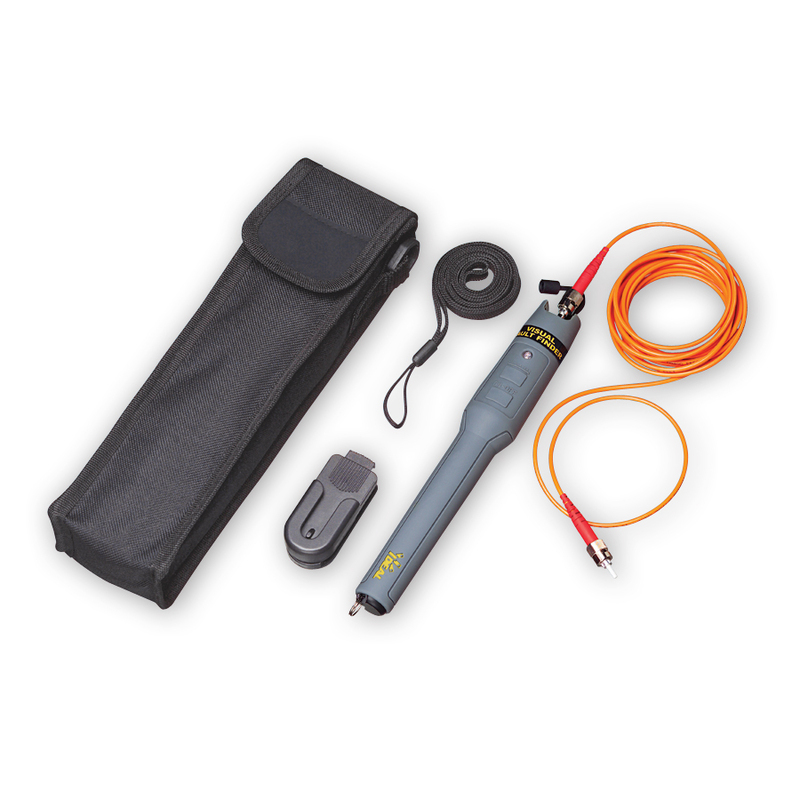 Quickly and easily locate high losses and faults in fiber optic cables extended reach. 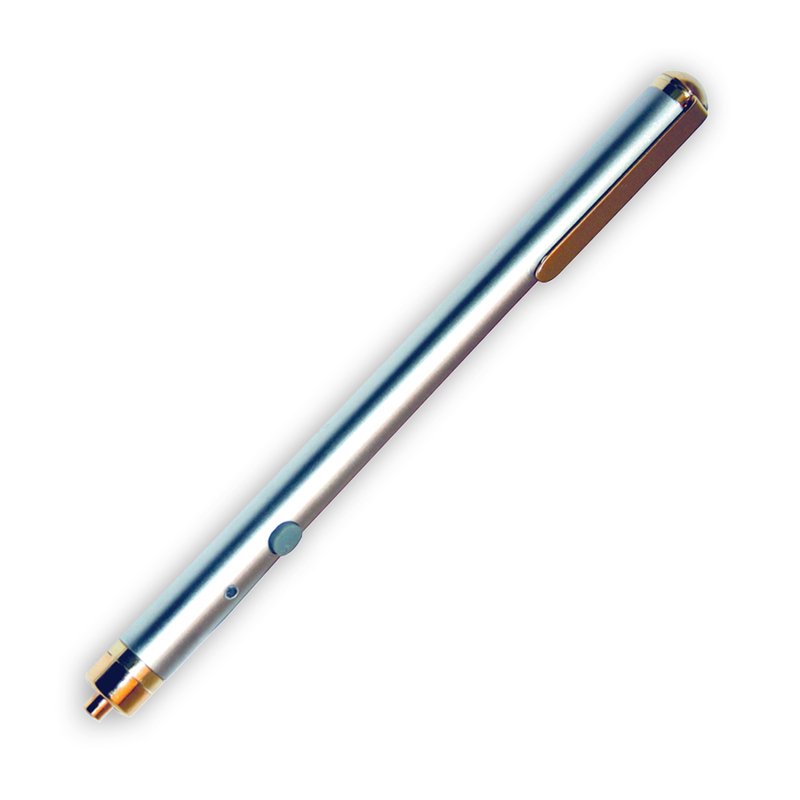 Up to 7km measurement range versatile. Pulsed and CW mode of operations. escape for analysis. The insertion loss induced by the macro-bend is too small to affect the signal on the fiber and the integrity of the fiber is unaffected by the measurement process. 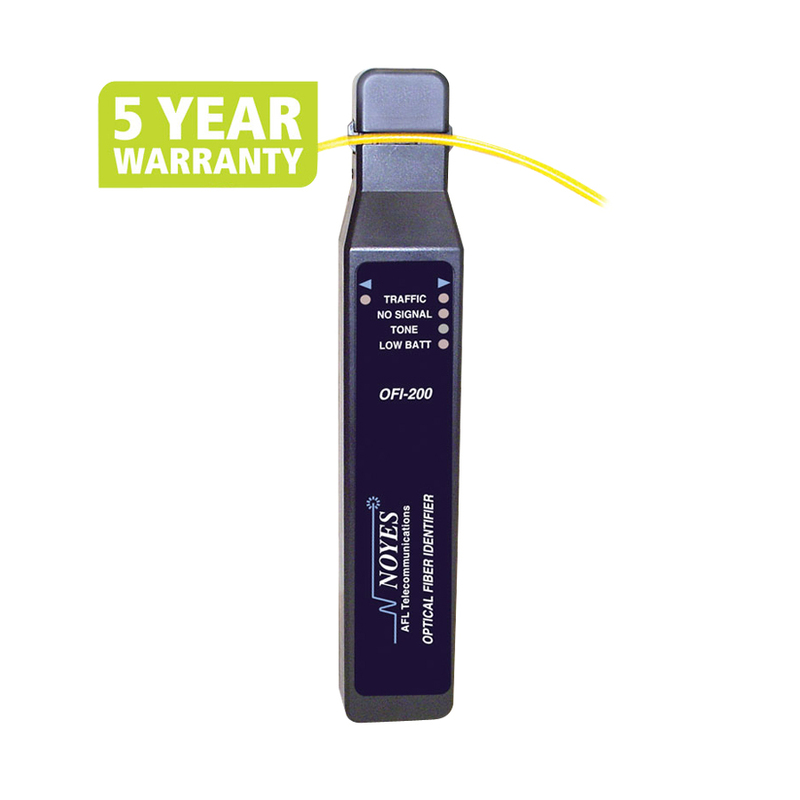 NOYES OFI-400 instruments are designed to be simple, easy-to-use and reliable. 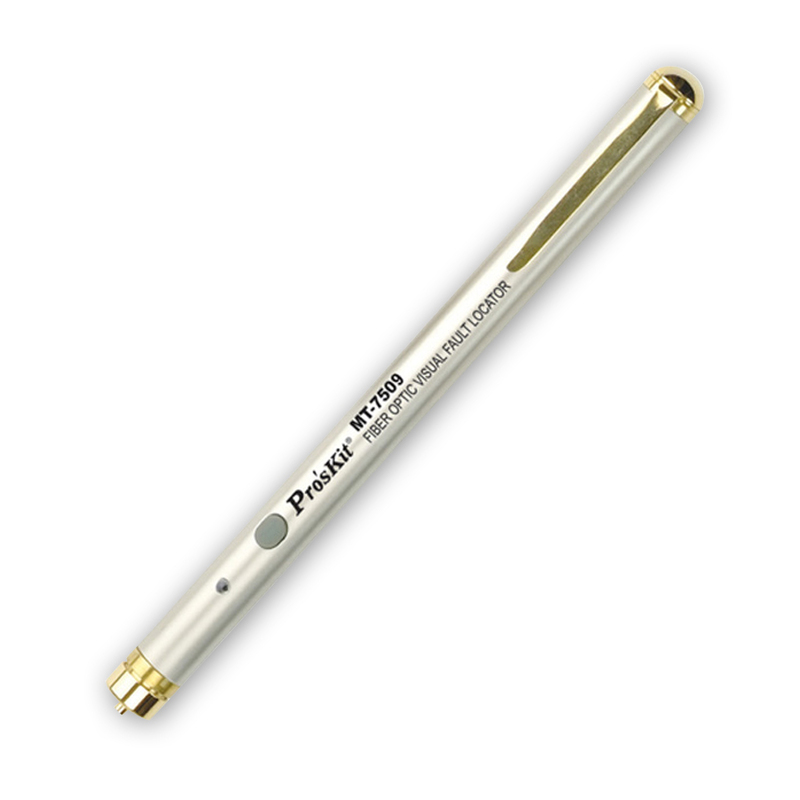 Each features an ergonomically designed macro-bend trigger that is comfortable to use. An integrated, backlit LCD display allows OFI-400s to be used in dimly lit spaces. 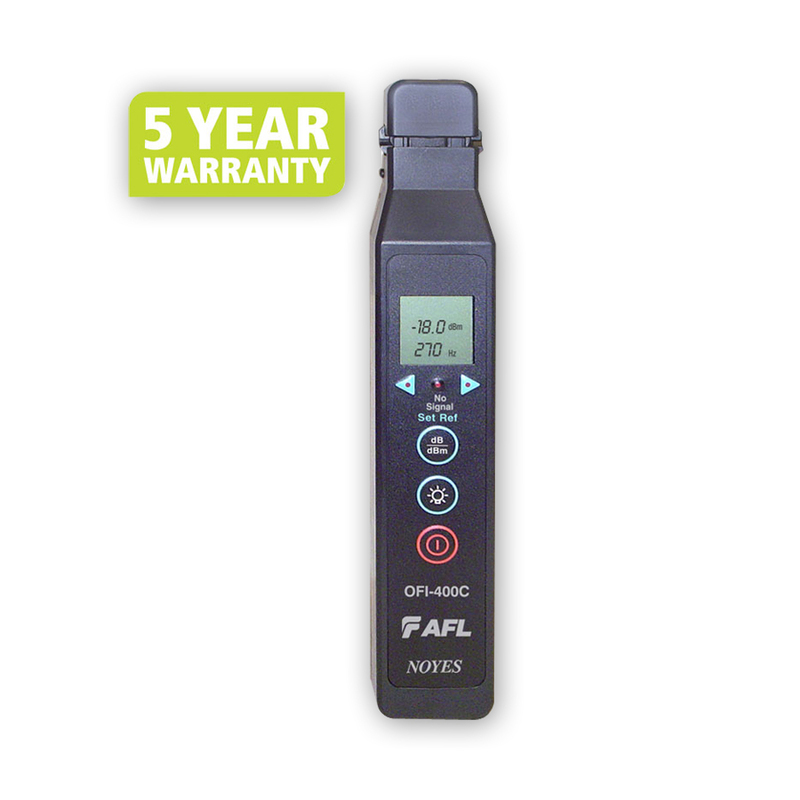 Powered by 1.5 V AAA batteries, the OFI-400 can make thousands of fiber tests before replacing batteries. The OFI-400 is designed for use with a wide range of single-mode fibers including 250 μm (bare) coated, 900 μm buffered and ribbon fibers or 2 mm and 3 mm jacketed fibers. The OFI-400 is ideal for network personnel involved in installation, reconfiguration, restoration and maintenance tasks that involve bare, buffered, jacketed or ribbon fibers in outside plant pedestals, fiber cabinets, aerial enclosures and inside plant premises demarcation cabinets. The slim design of the OFI-400 head facilitates access in crowded splice trays. Designed specifically for use with 2 mm or 3 mm jacketed single-mode fibers, the OFI-400C is ideal for general purpose maintenance, configuration and installation tasks. The OFI-400C is functionally equivalent to the OFI-400 but includes an optical head design and a calibration scheme optimized for use with jacketed fiber. 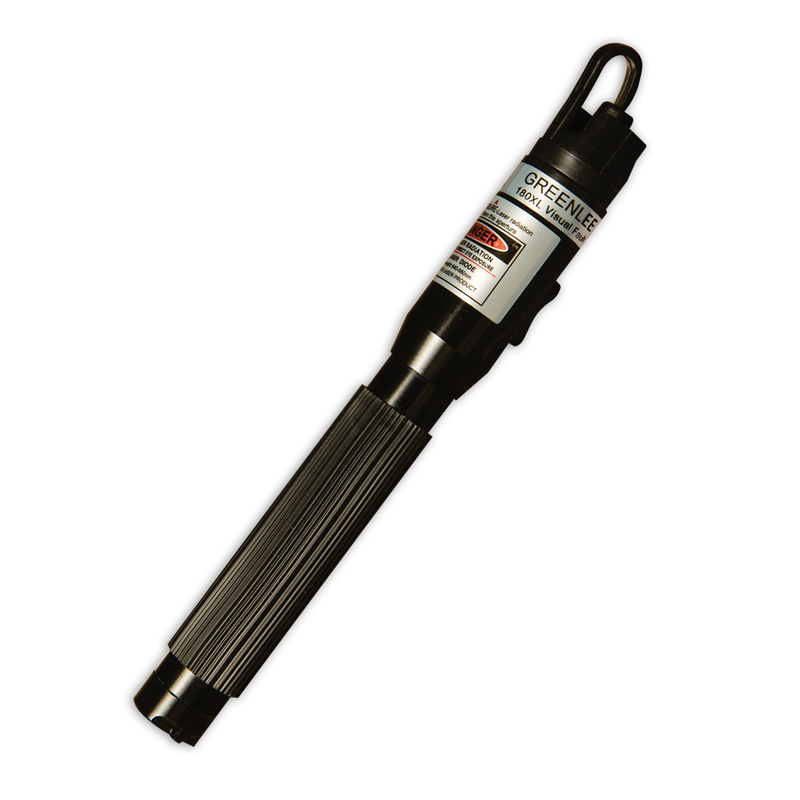 The OFI-400HP is designed for use where high levels of optical power are present. This includes fibers carrying a single high-power signal, CWDM or DWDM signals with high total power levels, amplified optical signals, or pump lasers associated with EDFA or Raman amplifiers. When display reaches +23 dBm (200 mW) or greater, the OFI-400HP will display “High” warning indication.